Note: Please enter personalisation in UPPERCASE as per the design. Sorry, item is currently unavailable. 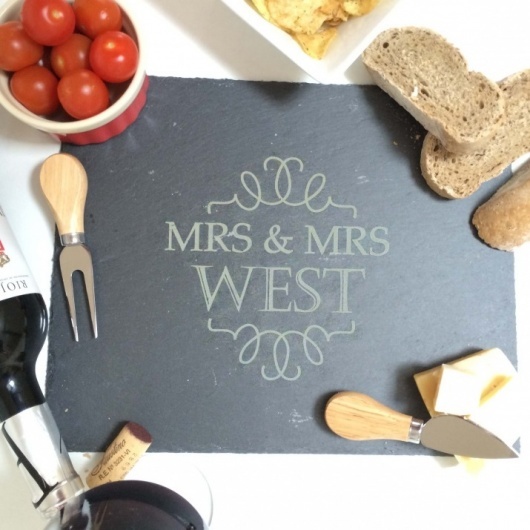 Fabulous Mrs & Mrs Cheeseboard for the newly married couple. All of our items benefit from free delivery if the delivery address is Mainland UK. If you are outside of this area your delivery costs will be calculated at the checkout stage depending on the delivery address. If you choose Fast and Free generally your item will be with your within 2-5 days. Please note however we use Royal Mail who do not guarantee delivery within this timescale. There are some items which due to their design and nature do take longer for our elves in the workshop to produce so please do check carefully the estimated creation date on the product description. If you want to guarantee delivery of your item quickly then you need to choose the expedited next working day (if ordered before 1pm) option at checkout. The item will then be sent with our chosen courier on a tracked service. Please note your personalised item can only be returned if the item is faulty or the personalisation you receive is different to that which you ordered. Please make sure you personalise this item by following the instructions in the product description carefully. Your item will be personalised as you add it into the boxes. It is very important that you check your grammar, punctuation and spelling carefully as we will not amend errors or add apostrophes. Please follow the instructions in the product description carefully. In some cases the design of the product will mean that whether you enter your text in upper or lower case the type will be amended.